Very good for flat water, but challenging for fishing. Took the SE370 down Bear River in Colfax, Calif., for some low key white water. She stood up just fine, bounced off rocks and made the requisite hard turns to avoid bad spills. Came to a screeching halt at one point when we didn't clear a big rock. The kayak stopped dead, I went flying forward, and the seat pulled loose (but didn't leave the boat). I got settled back down, bounced the boat free and I was off again. No damage to the kayak at all. Overall, an excellent experience on my first experience with any kind of white water. I bought this kayak for fishing at my local reservoir. Bought it used on Craigslist and got a great deal, but the price new is still very reasonable. It's convenient to not need a trailer or car top carrier to haul around and it's reasonably light for a grown man. 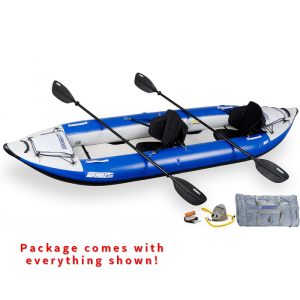 Might be a struggle to carry if you're on the smaller side, but it's a big kayak. I had my doubts about inflatables before I did my research, but this is definitely not a pool toy. Rated for Class III rapids, this thing is tough. The hull material is thick and I'm not worried about punctures even when fishing with sharp hooks. 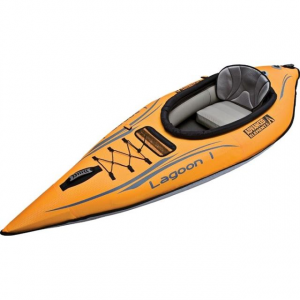 The primary drawback of this kayak for anglers is the lack of customization possibilities. You can't mount rod holders as there's nothing solid to connect to. Even the seats are inflatable and don't connect to the boat itself — you just inflate them and shove them down into the cockpit area. 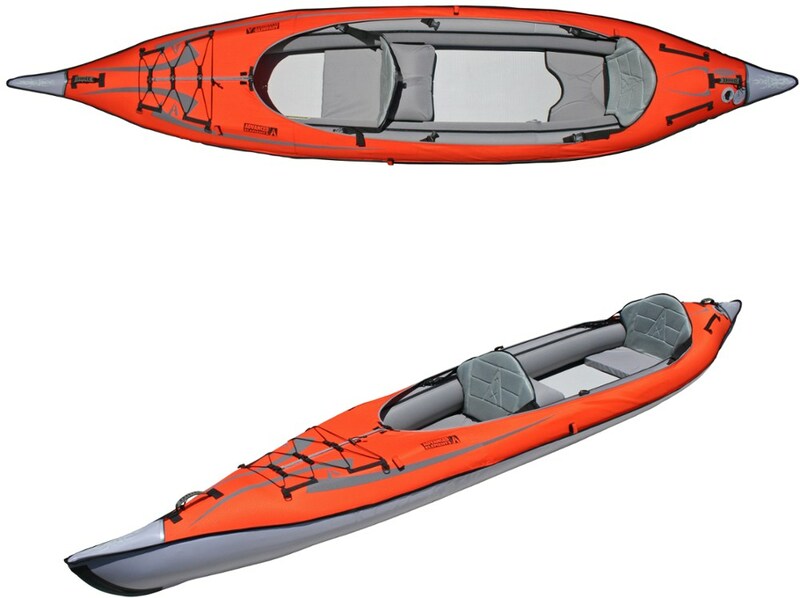 The inflated sidewalls of the kayak hold the seat in place. It works fine, but again, no connecting points. I did add a loop rope to connect the supplied bow rigging ropes to the stern rigging ropes. This gives me a place to attach a stringer, my anchor rope, paddle leash, etc. I also invested in a milk crate to hold fishing gear and mount rod holders. Haven't installed the latter yet, but it looks like it will work OK. Maybe not great for trolling since the milk crate won't secure to the boat, but it will work simply as a rod holder while paddling or using a different rod. The skegs on the bottom are tough, but they will definitely bend over to one side if you don't take care. My first time out, I was definitely yawing left because of a bent skeg. You can easily remedy this by heating up the skeg with a hair dryer and bending it back into shape. Keep in mind that, since this is an inflatable, it sits on top of the water. This makes it very susceptible to wind. Even in a light breeze, I found myself having to correct my position regularly while fishing if I didn't use my anchor. Keep this in mind if you paddle someplace windy. Finally, I'm glad I ended up with the 370 rather than the 330. As a fisherman and being fairly tall, I need the extra room. I'm sure the 330 would have worked out, but it would have been a much tighter fit. This is my first kayak, so there's a lot of trial and error going on here, but I'm happy with the boat so far. 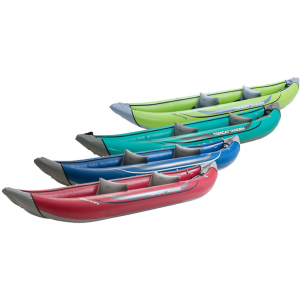 As an entry-level kayak, it's great, and if you can pick one up on sale or used, you really can't miss. Welcome to Trailspace, Ray! Thanks for taking the time to share such a helpful first review with us. I'd love to see some pictures of your kayak setup, if you're willing to add some to your review. Thanks for the update, Ray. Glad everything worked out OK. The Sea Eagle 370 is everything I hoped it would be, and more. 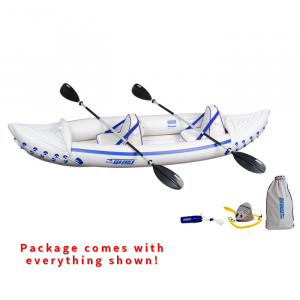 This inflatable kayak is what I’ll call quality with value. I wanted to get something to make my camping trips with my daughters more fun and appealing to them. Since they vary in age range, hiking (especially longer ones) aren’t always ideal. So I targeted something to play on the water with, and I researched a LOT before deciding upon the Sea Eagle 370. 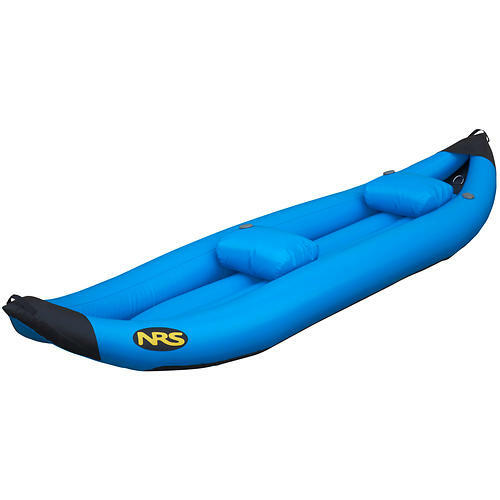 Stability – I was a little concerned here, due to it being an inflatable. But you feel very confident from the moment you step into the kayak, until you step out. Maneuverability – it goes well on the water! Paddles – they are okay. You can tell they are on the lower scale, but do an okay job. Wouldn’t mind a slight improvement here. Foot pump – I actually tried to have the foot pump removed from the package (have a pump, save costs), but Sea Eagle refused to do so. Which, I’m glad they did. 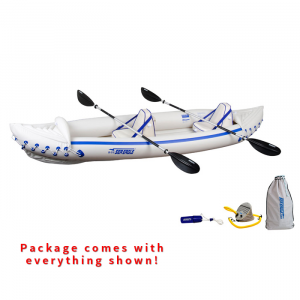 The foot pump is very efficient, and you are able to have the kayak inflated relatively quickly. It also works to deflate as well, and that obviously takes a bit more time to properly do so, and dry the kayak off. Seats – I did upgrade to the premium seat. Can’t say how they compare to the cheaper models, but I feel confident that I made the right decision. The seats are comfy, and sturdy. With a pocket if you need it. On the water it fits one adult and two children easily. Alternately it packs up great! It comes with its own duffle-like bag, that is quite compact considering everything in it. It’s not light, but it’s not unmanageable either. Not sure how other more expensive inflatables compare, but from my experience with the 370 – I am highly pleased I purchased. Thanks for sharing your kayak review, Robert. I'd love to see pictures of it in action (maybe before and after pumping), if you're willing to add those to the review.